Summary: Over 1000 Bogie Bolster wagons were refurbished by BR in the 1970s with new bogies and air brakes. Most were 52ft long Bogie Bolster Ds, which became BDAs, but two Cs were also rebuilt, becoming the short-lived BCAs. A large proportion of the BDAs remain in service today, many having undergone modification for specific duties. History: In 1964 the decision was made to standardise on air-brakes for goods wagons, and many new designs appeared over the next decade. However, BR also had a large fleet of vacuum-braked wagons that were incompatible with the new types yet had some life left in them. The Bogie Bolster C was the most numerous Bogie Bolster type built by BR, a total of 5691 being built between 1949 and 1962. All were 45ft long over headstocks with a carrying capacity of 30tons, and the final 1400 were built with vacuum brakes. Under lot number 3889, two wagons were rebuilt at BR Swindon in 1975 being fitted with Y25C bogies and air brakes. When complete, they were numbered in the air-braked series (as 960000 and 960001) and given the TOPS code of BCA (design code BC008A). For some reason, the design was not deemed successful and both wagons were transferred to the departmental fleet (as YVAs to design code YV060A) before premature withdrawal in 1983. The Bogie Bolster D was slightly longer at 52ft over headstocks, with a carrying capacity of 42 tons. Just over 3000 were built by BR and (as with the Bogie Bolster C) the majority were unfitted and mounted on plate bogies. The first air-brake conversion took place at BR Swindon under lot number 3888 in 1975, resulting in the appearance of BDA (BDA-R) number 950000. B942052, built at Swindon in 1955, was the source wagon used. The underframe was fitted with air-brake equipment, controlled by a single lever on each side, and mounted on fabricated Y25C bogies with shoe brakes. Most of the original Bogie Bolster Ds had two brake levers on each side, one for each bogie. The bodywork on the rebuilt wagon was largely unchanged and still featured five bolsters. In 1979 it was modified at Shildon to have six bolsters, bringing it into line with the production fleet that had by then started appearing. A plate on the wagon indicated that the modification was carried out under lot number 3926 but another source states that this lot number was assigned to the conversion of various wagons into concrete mixers. It is not known if the original design code of BD006B was changed at this point. One final change was the fitting of strap tensioning reels to the solebars, replacing lashing rings where these were fitted. Holes in the wagon floor allowed the straps to pass through. 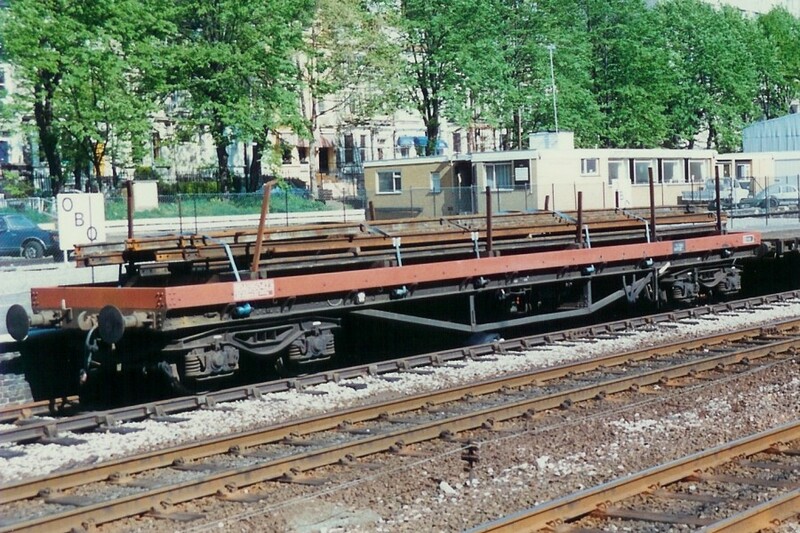 A photograph of 950000 taken in 1980 (and published in Working Wagons Volume 3) shows six tensioners on each solebar, in line with the repositioned bolsters. It is not known if tensioners were fitted before the 1979 modification. Lot number 3907 was issued for the first production batch of BDA rebuilds, converted at BR Ashford in 1977 and 1978. 200 wagons were involved, all originally built to diagrams 1/472 and 1/476 between 1950 and 1957, becoming 950001 to 950200 to design code BD006A. Six wooden bolsters were fitted and the wagons were painted in freight brown livery. A larger order for 600 wagons was placed as lot number 3925 soon afterwards, the conversions on these being done by BR Shildon. A new design code of BD006C was issued for these wagons, although the first 300 were essentially identical to the earlier batch. Wagons numbered from about 950513 upwards featured a different design of bolster. Formed from steel sections with wooden tops, the six bolsters were in the same position as before. The four central bolsters had thicker wooden tops than the two outer ones, variations in the height of the steel section resulting in a uniform overall height. This change was not reflected in the design code (which remained BD006C), but was later on recognised by a TOPS code alteration (see BEA). Another variation concealed by the standard design code was the fitting of experimental bogies to 3 wagons (950564 to 950566). The bogies were Outreau APO 22Y types, similar in appearance to the cast Y25C, and fitted with shoe brakes. Delivery of the batch, with numbers 950201 to 950800, ran from 1978 into 1979 and the last 50-odd wagons emerged in the then new Railfreight livery of flame red. Two more batches of BDA conversions were ordered, lot number 3965 covering 100 wagons (950801 to 950900) and lot 3968 a further 350 (950901 to 951250). The latter order had originally been for 650 wagons, which would have taken the number series to 951550, but it was cut back before work started. Both batches were converted at BR Shildon and were to design code BD006D, the difference being that the bogies now had disc brakes controlled by a handwheel mounted on the bogie. The lot 3965 wagons were delivered in 1979, the remainder in 1980 and 1981. In service, the BDA fleet found use carrying a variety of steel products including rod, reinforcing bars and sections. The type was particularly productive for longer products and was capable of benig loaded with items longer than the 50ft length of the wagon itself, provided that spacer wagons were coupled to each end. However, the decline in freight traffic overall meant that the BDA shared the fate of many of the new build and converted air-braked types, with relatively young wagons being transferred to departmental use. The first transfers to departmental use in fact occurred before delivery of the whole BDA fleet was complete. 950391 and 950782 were reportedly transferred to the CMEE fleet in 1979 and given ADC prefixes. The TOPS code and fate of these two wagons is not known. Prototype 950000 also joined the CMEE fleet as YNA ADC950000 to design code YN057A. A more wholesale transfer took place in November 1983 when 253 BDAs were recoded as YAA (YAA-B), and given DC prefixes, for use by the civil engineers. A new fishkind name of Brill was applied and some of the wagons were repainted in yellow livery. Former BD006A wagons 950001 to 950200 came under design code YA001A, 950201 and 950202 switched from BD006C to YA001B, and 950801 to 950851 from BD006D became YA001C. Two new TOPS codes were issued in late 1984 for use on BDA wagons. Wagon 950930 was the prototype conversion to BFA (BFA-S), the work involving changes to the bolsters to suit loading with steel bars. A further 59 conversions were authorised in 1985 being converted at Immingham wagon shops for traffic between Scunthorpe and Rotherham. Most of the conversions were from BD006C wagons, these being recoded BF002A. A few BD006D wagons were included and these became BF002B. Additional conversions to BFA, as well as a few reversions to BDA, took place over the next few years. The BFA fleet reached 90 wagons during 1989. The second new code was BLA, and the intention was that this would be applied to all the disc-braked BDAs numbered 950801 to 951250. These variants were apparently able to traverse tighter curves than the their shoe-braked sisters and the recoding was intended to make it easier for operating staff to differentiate the two types. In the event, the recoding was cancelled. A March 1986 fleet summary showed 933 BDAs still in stock. 59 BFAs had by then been converted, and 256 wagons had been transferred to departmental use as outlined above. The balance of three wagons had been withdrawn due to accident damage or wear. Although the bogies and running gear were quite new, the bodies of the BDA wagons were all at least 25 years old by then. Withdrawals, usually due to repair costs exceeding budgets, took place at a regular but low rate over the next few years. A new fishkind of Eel was assigned in 1987, this being for YAA Brill wagons that had the sides and ends removed, along with all the bolsters, and a new steel floor fitted. New low ends with two stanchions were added and the variant was intended for use carrying track panels. DC950181 was the prototype conversion, recoded YMA and repainted with yellow solebars and bufferbeams, the floor and ends being grey. It was withdrawn by 1989. In 1988, eight wagons were modified with tall stanchions for use on timber traffic from Ashford. Surprisingly, the wagons were used were some of those transferred to the civil engineers fleet as YAAs. They were recoded BTA later in the year (although officially remaining as YAAs) and were joined by a further 11 examples. The BTA code (BTA-B) was officially assigned during 1989, with four wagons recoded by the end of the year. 1989 also saw 34 more YAAs revert to revenue use. 16 were simply recoded as BDA while the other 18 were modified as BMAs. The BMA fleet already included former Boplate wagons (BPA) converted for steel and aluminium traffic from Scunthorpe and Fort William. Ex BPA wagons became BMA-A, while the former BDAs were coded BMA-B. The conversion involved removal of the bodywork and the fitting of additional bolsters and new, taller, ends. Most of the conversions were from shoe-braked wagons, these being allocated design code BM002A. Wagon number 950833, a disc-braked example that had latterly been a BTA, was added later and this took code BM002B. More BDAs became BMAs over the next few years. Plans to replace the BDA fleet with new wagons were drawn up in 1989 and 12 prototypes to three designs appeared in 1990 as the BGA, BHA and BJA types. Despite this, no more orders were placed and the BDAs soldiered on. Two YAA wagons were recoded YXA (YXA-I to design code YX061A) in 1990 for use carrying the specialised Bridge Beam wagon sets. Five more YXAs had been added by 1994. The Signal and Telegraph Engineers deparment received some BDAs in 1991, these being recoded as YNA to design codes YN061A (ex BD006A) or YN062A (ex BD006D) and given KDC prefixes. Further transfers in 1993 were to design code YN064A. One code to dissappear during 1991 was the BTA, all examples being recoded as BMA or YNA. 26 BDAs were fitted with modified bolsters for carrying large diameter pipes during 1991. This did not result in a change of TOPS or design code, and the wagons replaced air-piped BQW on workings from Hartlepool. A new TOPS code for the type was applied in 1992 when 950433 was recoded as an RSA (RSA-B to design code RS006A) for use as reach wagon at Jarrow Oil Terminal on Tyneside. At about the same time there was a plan to issue new AARKNDs to distinguish variants in the main fleet. BDAs with disc brakes woud become BDA-D, those with shoe brakes BDA-H and a third code of BDA-L was for wagons with low bolsters, all of these having shoe brakes. This does not appear to have been implemented and all BDAs remained as BDA-R. Starting in 1992, some BDAs were rebuilt (at Cardiff Cathays, BRML Doncaster and York WRD) into cable-drum carriers for the S&T Engineers. The wagons were recoded YVA (YVA-Q) with KDC-prefixed numbers and design codes YV078A to YV078E. Later conversions were assigned to the newly formed BR Telecommunications section, these being given BDC prefixes. Source wagons included former BDAs, YAAs, and the prototype 950000. Doncaster and York were both also involved in a small program to fit concrete mixers to six YAA wagons. Intended for the Electrification engineers, the resulting wagons were recoded YYA (YYA-L to YY048A) and given LDC prefixes. There were no major developments during the brief tenure of the three regional reailfreight companies but English, Welsh and Scottish Railway (EWS) made its mark on the fleet quite soon after taking over in 1996. Firstly, many of the unmodified YAA wagons reverted to being BDAs. The distinction between departmental and revenue earning wagons was no longer relevant. Secondly, BDAs, BFAs and BMAs that were overhauled under a contract placed with Marcroft Engineering were repainted in the new EWS livery of overall red with yellow lettering. Modifications to the fleet resumed in 1997, the first being a pair of BDAs done at Thornaby depot. 950965 was fitted with dual bolster/coil fittings and 951124 modified for heavy section rod coil, both retaining the BDA code. Next up were 30 additional BFA conversions. These had taller stanchions than the earlier BFAs and were accordingly coded BFA-T to design codes BF003A and BF003B. The batch was used carrying steel slabs from Port Talbot. Later in the year, the BTA code reappeared, following the conversion of wagon 950187 at Thornaby (as a BTA-Z to design code BT006A). Designed for carrying pipes, the wagon had its sides reduced in height and six sturdy stanchions fitted along each side. The stanchions had a large, square section and were about 7ft tall with sloped tops. The wagon was painted in EWS maroon (including solebars and bufferbeams) with the tops of the stanchions picked out in yellow. A further 29 conversions were undertaken at Thornaby in early 1998 and the type was used on flows from Hartlepool to various destinations in Scotland. Three new AARKNDs were issued for the conversions, namely BTA-A, BTA-P and BTA-Z, although BTA-A seems to have been allocated to the entire second batch, along with design codes BT007C and BT007D. Compared to the prototype, the new batch of BTAs had just four stanchions on each side. Another AARKND introduced at the same time was BDA-Z, this being for BDAs that received depot overhauls. At least twelve wagons were so coded, gaining new design codes BD007A and BD007B. To differentiate the BDAs fitted with the revised bolsters, the new TOPS code of BEA (BEA-A) was issued in 1998. This would have applied to all wagons numbered from about 950513 upwards but modifications over the years meant that many of these remained as BDAs, while at least four earlier BDAs were recoded BEA. Shoe braked wagons (ex BD006C) took design code BE004A while disc-braked examples (ex BD006D) became BE004B. BE004C was applied to former BD006A wagons. The BEA fleet stood at 292 wagons by April 1999, rising to 316 by 2008. A development that affected the BMA fleet from 1999 was the recoding of former Boplate examples (BM001A) as BNA (BN002A), leaving the former BDAs as BMAs (BM002A/B). The converted wagons were essentially identical so the purpose of this exercise is unclear. Indeed in early 2008, ten of the BM001A wagons remained so coded. A fleet survey in mid 1999 showed a total of 1182 wagons still in stock. This comprised 1113 revenue-coded wagons (649 BDA, 292 BEA, 93 BFA, 48 BMA and 31 BTA) and 69 departmental (23 YAA, 2 YNA, 37 YVA, 4 YXA and 3 YYA). The age of the wagons, plus the delivery of new BRA and BYA types, saw withdawals gather pace over the next few years. One interesting development was the conversion in 2001 of six former YVA cable-drum carriers into beam carriers for use by Balfour Beatty. The wagons were curiously recoded as BDAs, albeit with a new AARKND and design code (BDA-I and BD006F). By 2008 the overall fleet had reduced to 846, made up of 388 BDA, 316 BEA, 61 BFA, 19 BMA, 31 BTA, 2 YAA, 27 YVA and 2 YXA. 613 of this total were still in regular use. Most of the withdrawn wagons had been scrapped, a notable exception being about 90 that were sold to Corus for internal use at Lackenby steel works. These wagons had their bodywork removed and the underframe shortened by cutting out an 8ft 8in section from the centre. A girder framework was built up to carry hot steel slabs and a photograph of one such conversion appeared in the August 2007 issue of Rail Express magazine. An interesting development took place in early 2015 when BDA 950321 was fitted with a new box body by W H Davis. Recoded as an MXA (MXA-A to MX004A), the wagon was repainted in DB red livery. Updates: 10/05/2015: MVA conversion added. 15/03/2013: Photo links (finally) updated. YNA (ex BCA) ADC960001 at Eight Ash Green, 28th July 1980. BDA 950423 (lever brake) at Kensington Olympia on 2nd May 1987. BDA 950260 (lever brake) at Newport, 25th October 2006. BEA 951120 (wheel brake) at Newport, 6th November 2006. Page added: 16/12/2007 Spotted an error? Got some additional info?